Use Imagine Biodegradable Liners when needing to apply petroleum-based diaper rash ointments or antibiotics to baby’s bottom. Create a “cloth diaper-safe” barrier by placing a biodegradable liner between your baby’s skin and your prefold cloth diaper or all-in-two insert. To do this, simply lay a liner on top of your prefold cloth diaper or all-in-two insert after it is positioned in your diaper cover and then diaper, as usual. 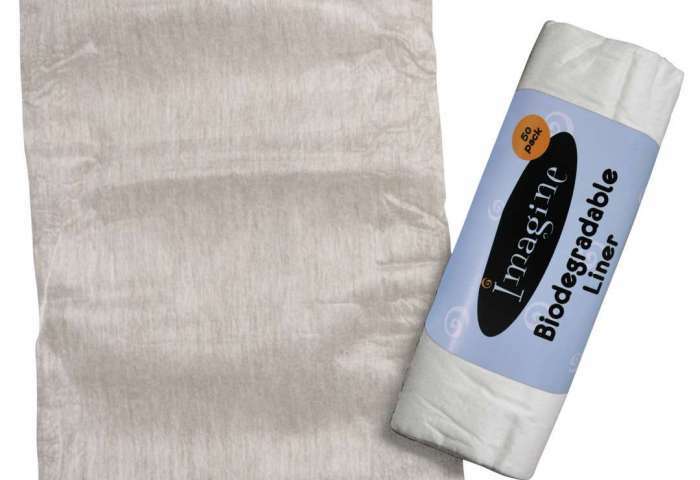 Imagine Biodegradable Liners come in a pack of 50 and each liner is a generous 7.5″ x 10.5″. Liners are made of biodegradable 50% viscose & 50% wood pulp and are flush-able. Remember to throw dirty liners in your garbage or flush them down the toilet after each use. Please do not drop Imagine Biodegradable Liners in with your dirty cloth diapers!